Nights are a bit of a trial at the moment. Sleep comes in shifts, my body grumbling every few hours, forcing me to grab my crutches, prod my way upstairs, then poke my crutch-supported way back down to the bedroom while it recovers. Despite the recent surgery, it isn’t pain that’s keeping me awake, but discomfort. Sleeping on my back is usually my last-gasp gauntlet flung at sleeplessness. After I’ve gone through the alphabet finding book titles, authors, or films to match each letter. After I’ve consciously relaxed every muscle I can identify, one by one. Lately I’ve been waking far too early for a natural owl’s metabolism. But today’s was a somewhat later, rude awakening. Yanked home from the Land of Nod, when day had already dawned, a curtain noisily pushed back on the world robbed me of my sleep. While my open eyes adjusted to the light my mind struggled. Did I miss a spectacular storm in the night? Surely not, I was up four times, I would have noticed a howling wind and lashing rain. Were my eyes blurred, some unknown side effect of who knows which of the drugs I’ve been taking? Coming together at last, my vision and mind began to recognise the truth. The veil hanging between me and the morning was not a film of wind-borne salt on the windows, it was fog. Fog upon the hill. Feeling very still. Better not quote much more or the remaining Beatles might sue me for plagiarism. 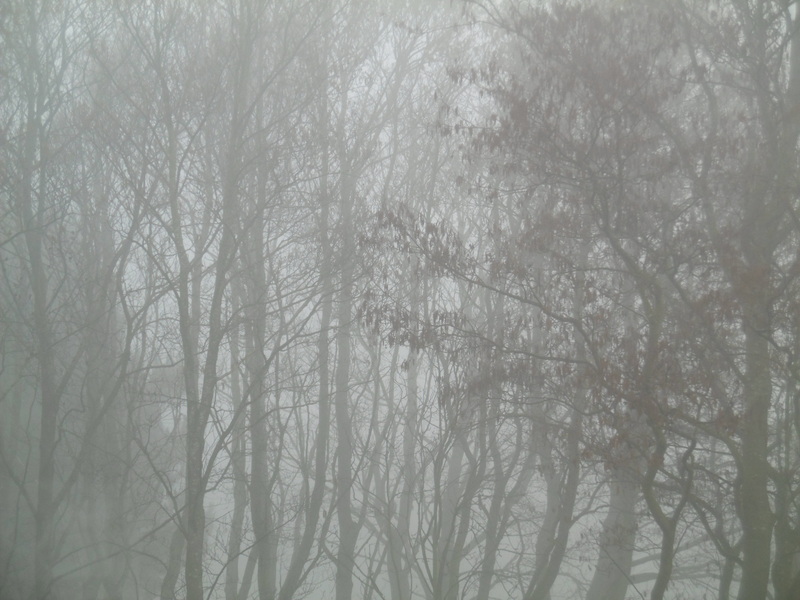 But there were no Blue Jays out and about – and this fog was not the sinister kind. No, it felt cosy, comforting, kind. I lay, for a little while longer, on my back. A cup of tea, I knew, was sitting on my bedside table, a biscuit in the saucer. Relishing the feeling I slid back the years – because, after all, what was out there? Just now, just here, just me. A cup of tea and a memory. I could see the fabric of my new winter coat. The mohair that would have itched my neck if it weren’t for the soft, furry collar. My strapover shoes, brown as polished mahogany, worn for the first time with ivory knee-length socks. An Alice band holding back my hair. In the end the freezing fog won. We all turned home, my mother, my father, my sister and I. It would have been the last time I saw my cousin Anne until my mother’s funeral, thirty years later. 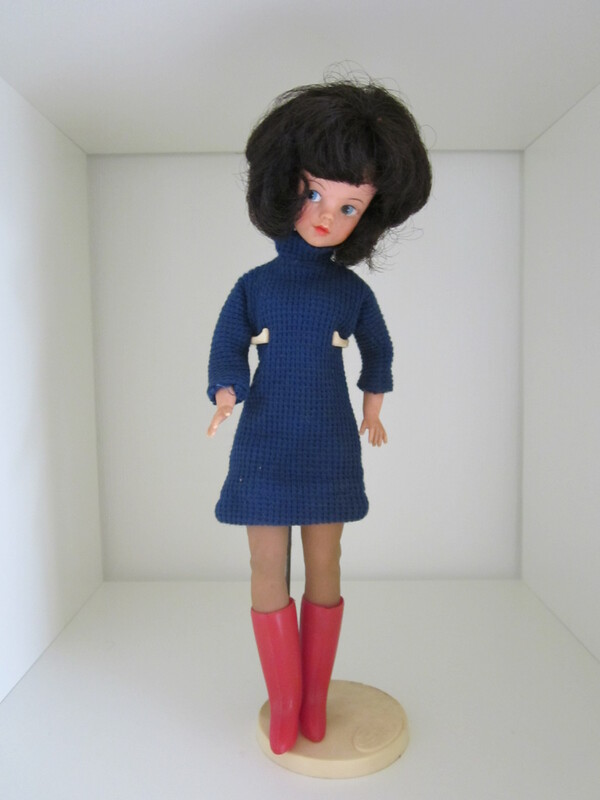 Beautiful and black-haired, she was the reason my Sindy doll was raven-haired not blonde. And it was her wedding day. Over the hills and far away. But, for us, it was not to be. The memory seeped away. Discomfort, like the freezing fog, had won. I manoeuvred my way up in bed and leant on a stack of pillows while I sipped my tea. Not a needle of the pines, not a twig among the budding branches stirred. I felt as if a feather quilt had been wrapped around my little bit of the world – and the rest thrown away. No need to bother about outside, it wasn’t there. A plump wood pigeon docked on the garden fence. The only thing moving as it dipped its way through yet another attempt at a courtship with some potential mate beyond my field of vision. As if we need any more of the things. The transporter planes of the bird world, their lumbering, clumsy bodies lurch around on short legs and splayed toes. Squashing green shoots as they amble around picking up seeds and nuts dropped below the feeders carefully designed to elude their pecking. 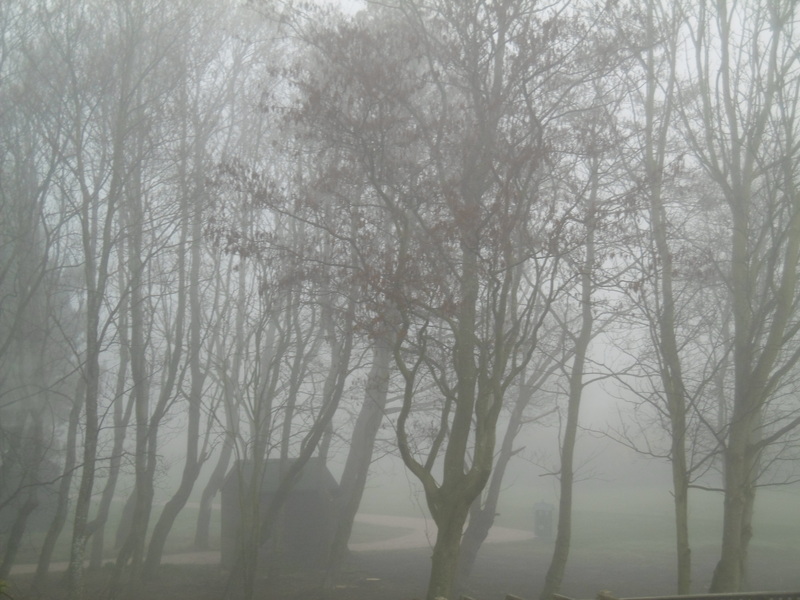 A change came over the light – and the fog closed in. It could have been menacing, I suppose, but it wasn’t. It just felt as if the blanket of seclusion had been wrapped a little more tightly around us – and I could see no reason to move. Why face a day that doesn’t exist? My long-suffering carer had to catch a train – and I had to shower before he went, to be on the safe side. A bowl of porridge with golden syrup later I was settled in my chair with the newspaper – and the easy crossword. Engrossed in the clues, two still left partially filled, to my exasperation, I looked up towards the window and smiled to see the colourful posy of flowers in our old green vase. Sent by a friend from the other side of the country to cheer me. Which they did – and do. Since Sunday three lots of flowers have arrived. Tulips and pale, scented narcissi. Stately roses in red and white and pink. Spring-fresh forsythia with jaunty vivid gerbera. All set off by evergreen foliage. A new, colourful plant from our neighbours says ‘welcome’ in the hall. How lucky am I? It feels like there are hugs everywhere I go, pretty, happy hugs. But back to my morning’s armchair. There, I lifted up mine eyes to the heavens. Here comes the sun, sang the Beatles, in my head. And as they sang, I thought – it’s all right. The world was back. And it was beautiful. This entry was posted in Britain now & then, Lancashire & the golf coast and tagged Beatles, Blue Jay Way, crutches, flowers, fog, Here Comes the Sun, recuperation, Sindy doll, sleeplessness, sun, weddings. Bookmark the permalink. Thanks Paula, kind of you to say so, m.
Whenever I can’t sleep “It’s been a hard day’s night…” I walk around the garden in my mind. It somehow works to sooth and I never complete the full circuit. “I get by with a little help from my friends”… flowers, gifts and gestures somehow facilitate recuperation, a visual reminder of positive thoughts and care. Nice one Elladee! You put me to shame with your Beatleing! And me a one time dweller in nearby Liverpool. 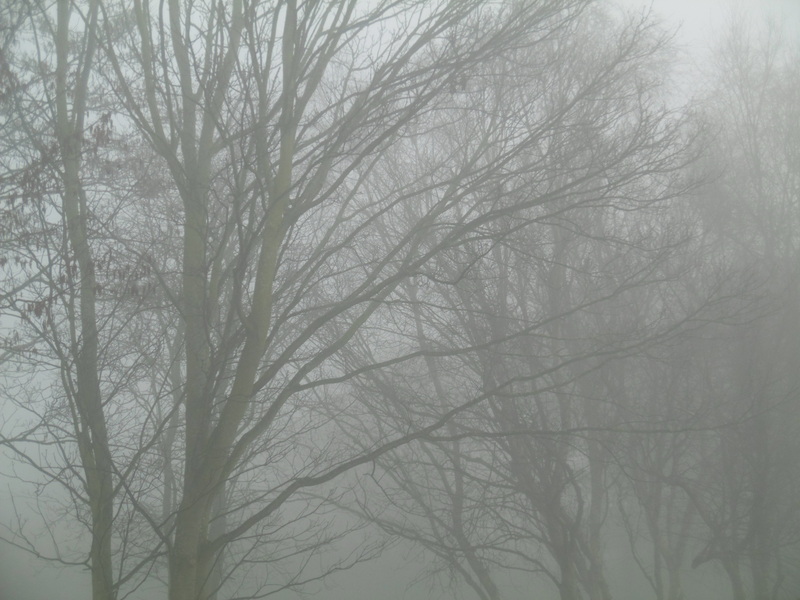 We had a second shrouded morning, though it was more like mist – we don’t have fogs ‘Here beneath the blue suburban skies’ as much as we used to – the end of the smoky industrial era for the north of England. We used to get terrible yellow choking ones that left soot behind when they lifted. But this was nice and clean and like a respite from the real world, a time to just ‘Let it be’. Hi Mary, hope its getting better all the time. Re your last post, I managed – finally – to beat my way through Dostoevsky’s ‘The Idiot’ (being one obvs) and strangely, that leaves ‘Take a Girl Like You’ by Kingsley Amis the only unfinished book in my entire collection. It was a random holiday purchase in a second hand bookshop a long time ago and since then, I’ve had a battle with it – probably wildly incommensurate with its value (imho).I’m strangely guilty about being defeated by it, which might be a generational thing but books (and the Sunday papers) do that to me. Anyway, keep well and here’s a hug. Hi Ed and thanks! It is going well, much better than anticipated, thank you. Did a rather long turn around Churchtown gardens on Sat as a gesture of support in face of the cuts (another post in the offing) and suffered for it. But I’m OK now.